MÁLAGA, Spain, Jan 28 2014 (IPS) - Before sunrise, a Moroccan woman waits her turn at the pedestrian border control separating her country from the Spanish city of Melilla. Hours later she crosses over, takes up an 80-kilo bundle of merchandise and carries it back to her country, for a payment of less than six dollars. Every day thousands of women like her cross the border posts between Morocco and the cities of Ceuta and Melilla, Spanish enclaves in the north of Africa, to pick up heavy loads of goods and carry them across the border on foot, a trade worth millions of euros that is profitable to business on both sides. The business community in Melilla “lives off this contraband trade,” made possible by thousands of women porters who work “to survive and feed their children,” José Palazón, the founder of the Asociación Pro Derechos de la Infancia (Children’s Rights Association), who has lived in the city for 14 years, told IPS. “They are single mothers, widows, abused women, with disabled husbands, women excluded by society, who turn to contraband in order to make ends meet,” union leader Abdelkader El-Founti of the Melilla General Workers’ Confederation (CGT) told IPS. When the Barrio Chino border post in Melilla opens at 9:00 a.m., the woman porter shows her passport and walks to an esplanade where several vans have left bundles ready for carriage early in the day. She ties the huge bundle to her back with ropes and walks back for over 200 metres, weaving through the crowds in the narrow pathway. She delivers her load on the Moroccan side and returns to carry more bundles across until the border post closes at 1:00 p.m. In Ceuta and Melilla this activity is known as “atypical trade”, and Moroccans live with it as tolerated contraband. White signs bearing black silhouettes of men and women porters hang high on the iron railings of the narrow passage in Barrio Chino to indicate the entrance. The women are paid when they deliver their loads on the Moroccan side, where men with wheelbarrows or vans wait to collect them. The amount depends on the weight carried. “The maximum is 10 euros [13 dollars] a day. For each load they are paid three to five euros [four to six dollars] according to weight,” El-Founti said. In addition to the physical exertion, the women must put up with “all kinds of abuse from the Spanish and Moroccan police,” he said. “Humiliating treatment is meted out to the women, who are mistreated by the police on both sides of the border. You only have to be there for five minutes to realise this,” Amin Souissi, a Moroccan national belonging to the Andalusia Human Rights Association (Asociación Pro Derechos Humanos de Andalucía) in the southern Spanish city of Cadiz, told IPS. Souissi recalled the death in September 2013 of a young porter from the Moroccan city of Tetouan who, “tired of so much humiliation,” set himself alight at the border post of El Tarajal in Ceuta, after his country’s authorities confiscated the goods he was carrying. “We don’t want them to lose their livelihood, but we do want the human rights of these persons on the borders of Ceuta and Melilla to be respected,” said Souissi, who has seen police push women porters around with their truncheons. The enormous loads contain all sorts of goods, such as blankets, used car tires, food and diapers. The vast majority of porters are women, but some are men, especially young men with limited resources. Many women cross the border with smaller packages. Others work as domestic employees in homes in Melilla and Ceuta and go home to Morocco at the end of the day. About 40,000 people cross daily between the Moroccan town of Beni Ansar and Melilla, but only 10 percent of them have visas, said El-Founti. Porters have to show their passports, and the rest have special permits, under an agreement between the Spanish and Moroccan governments, to work in Melilla during the day and return home at night. “They are construction labourers, domestic employees and hotel workers who work a 10- or 12-hour day for less than 200 euros [270 dollars] a month, without any labour rights,” he said. El-Founti complained that business owners in Melilla take advantage of the fears of “cross-border employees” of losing their jobs, and of their poverty. “Many Moroccan women who work as domestics in Melilla are illiterate and ignorant of their labour rights,” he said. The traffic in goods carried by the porters “moves a great deal of money both sides of the border,” said Palazón, who believes it will be “very difficult” to stamp out this situation; however, he called for greater dignity for the workers and improved border facilities for their daily crossings. “There is not even one drinking water tap,” said Souissi about the El Tarajal border crossing in Ceuta, which “is more like a cage than a pedestrian border crossing,” with narrow passages that the porters can barely squeeze through. The border trade is worth 1.4 billion euros (1.8 billion dollars) a year to both sides of the frontier, and contributes one-third of the economy of Ceuta and Melilla, the two autonomous Spanish cities. Some 45,000 people depend directly for their livelihoods on this activity, and 400,000 are indirectly employed, according to the American Chamber of Commerce in Casablanca, Morocco, quoted in the Declaration of Tetouan signed by almost 30 organisations in April 2012. The declaration states that “an important quantity of money” is paid as bribes, totalling 90 million euros (121 million dollars) a year, according to the independent Moroccan weekly Al Ayam. Conditions at the border crossings, where thousands of people crowd together, have already caused fatalities. In November 2008, Zafia Azizi was trampled to death in Melilla and on May 25, 2009, Busrha and Zhora, two Moroccan women, died in a human avalanche at the Ceutan border post of Biutz. 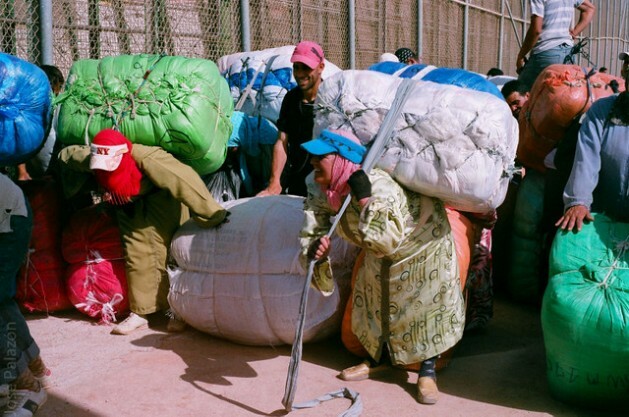 Activists consulted by IPS said the European Union (EU) is not paying proper attention to the human rights violations suffered by the Moroccan women porters. Ceuta and Melilla enjoy a special fiscal regime with substantial tax rebates and are not part of the EU’s Customs Union. Both cities can import goods at lower tariffs than the rest of the EU and sell those products to Moroccan citizens, who send them to Morocco through the irregular cross-border transit system for re-sale.